Pete joined Forth Valley Magic Circle in May 2006 and became President in 2009. He completed 3 years as President between 2006-2009 as is allowed by our constitution. He is a National Award winning children’s entertainer known as ‘Magic Pete’ and is actively working most weekends and covers all over the Scotland. His shows are taylored for any age group and are very popular with local Primary Schools. He is also fully Enhanced Disclosure. 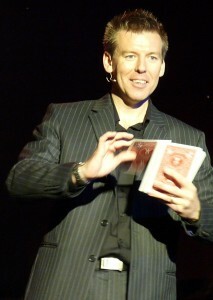 Pete was also the Scottish Stage Magician of the year 2011, beating off stiff competition from all over Scotland. Pete is also a member of Equity which includes £10 million public Liability. Pete’s favourite magicians are James Brown, David Stone, Etienne Pradier, Michael Ammar, Olmac and Oz Pearlman. www.scottishmagic.com which he co-owns with his friend Colin MacKenzie.